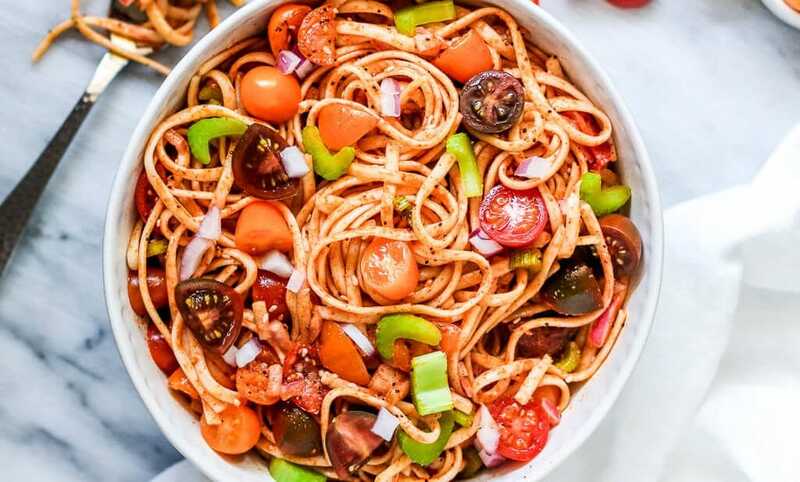 This pasta salad is my ultimate BBQ go to featuring fresh heirloom tomatoes, celery, red onion, and a mix of delicious seeds & spices that make for a totally unique show stopper salad! Best part? It’s even better eaten the day after it’s made so less stress for any party planning you have to do! 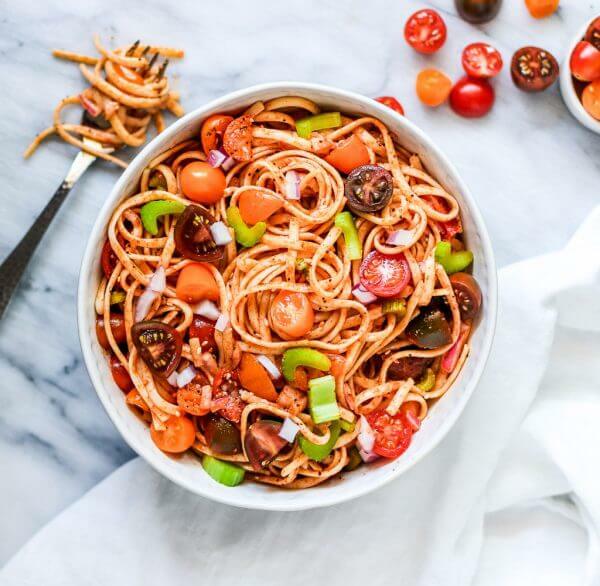 I can’t wait for you to try this Healthy Vegan Linguine Pasta Salad! This pasta salad was truly one of my biggest kitchen accomplishments! Why you might ask? Basically, I took a favorite, yet processed, pasta salad recipe I’ve been eating for years and reverse-engineered it into the healthy vegan version you are seeing today. The big difference is that my version is made without two products our family recipe relied on: McCormick Salad Supreme and Wish-Bone Robusto Italian Seasoning. After doing some ingredient digging I realized both these products are not vegan and contain a lot of additives that I try to stay away from these days. Processed and Powdered Dairy Products. The McCormick salad supreme lists the ingredients of “Romano cheese, buttermilk powder, lactose, whey, non-fat milk solids, and cheddar cheese”. While I still eat cheese, I personally don’t feel great about packaged cheese/milk that can sit on a shelf for months to years without needing refrigeration. That usually means it’s pretty processed and likely has fillers added to “maintain freshness”. Natural Flavors. Both McCormick salad supreme and Robusto contain “Natural Flavors”. That may sound okay because of the word “natural”, but frankly, that’s just marketing at it’s best. Most natural flavors are added to products to help add back flavor lost in over-processing food. They also help maintain the consistency of the product, meaning it’ll taste the same any time of year regardless if it’s in season. A lot of times, it’s chemicals you might have found in the original plant, but made by flavorists in a lab. I try to stick to the motto of if I can’t find it in nature, I shouldn’t be cooking with it at home. 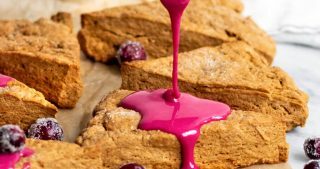 Hopefully, this gives you a little insight into the motivation behind this recipe and some of the ingredients I try to avoid in my plant-based diet! So now onto the fun part- the actual recipe ingredients! Instead of soybean oil & distilled vinegar in the original Robusto dressing, I opted for a mix of olive oil, champagne/white vinegar, & apple cider vinegar instead. For the seasoning, I focused the ingredients around the spices on the McCormick salad supreme and experimented with various amounts of paprika, poppy seeds, sesame seeds, celery seeds, black pepper, red pepper, and garlic powder. Then all you need are some fresh cherry tomatoes, celery, and red onion to add some good crunch. It took a few tries, but the end result ended up being so shockingly like the pasta salad I remembered eating at every childhood Memorial day picnic… I was amazed! This pasta salad is definitely best eaten cold and, personally, I like it best the day after making it so all the flavors can soak into the vegetables and pasta noodles. Once you buy all the ingredients, the prep is super simple and this is truly an easy and unique pasta salad to throw together all summer long. Hope you enjoy! Cook the linguine according to instructions. Once cooked, strain and place in the fridge to cool. While the linguine is cooking you will also chop the tomatoes, onions, and celery and add to a large mixing bowl. Once the veggies are chopped, add all of the dressing ingredients to a small bowl and whisk until thoroughly combined. Pour into the mixing bowl containing the veggies and stir until the veggies are evenly coated. Next, add all of your seasoning ingredients to a small bowl and stir to combine. Add to the bowl containing the veggies and dressing and stir in to evenly coat the veggies. As a final step, take the cooked linguine from the fridge and add it to the bowl with the veggies, seasoning, and dressing. Stir all the ingredients together until the noodles are evenly coated and the veggies are mixed throughout the pasta. Store in the fridge at least 2 hours to chill and ideally overnight for the best results. Enjoy! Subscribe so you never Miss a recipe!